Hunstanton Queen of the Norfolk Coast. Vintage BR Travel poster by William Fryer. Vintage British Railways (Eastern Region) travel poster. Artwork by William Fryer. 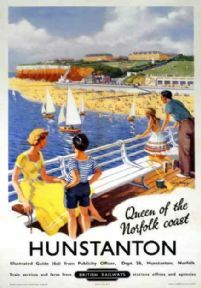 'Hunstanton; Queen of the Norfolk Coast', BR (ER) poster, 1948-1965.